The Ultramarine Lorikeet (Vini ultramarina) is spectacular looking lorikeet and, sadly, the most endangered lorikeet in its natural habitat on the Marquesas Islands of Nuku Hiva, Ua Pu and Ua Huka. In fact, it is now one of the 50 rarest birds in the world with an estimated population of only 1000-2499. The greatest threats to their continued existence are rats and cats that were introduced into their natural habitat; avian malaria and loss of habitat (land conversion for agriculture as well as wild fires). They occur at elevations above 700m (2296 ft), but are also seen on banana, coconut and mango plantations along the coastal areas. 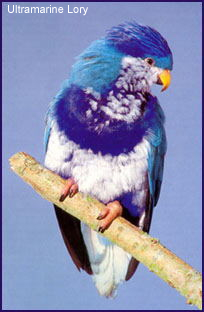 Their plumage is colored in varying hues of blue and white. Ultramarine Lories are noisy and conspicuous even in small groups. They are generally approachable, especially when feeding. Their natural diet consists of a variety of fruit, buds, blossoms, pollen, nectar as well as insects. They are often seen feeding in flowering trees.